Modeling best practices for association members. The association's brand guide (PDF) outlines how NSPRA’s brand assets – including logos, name, tagline, colors and typography – are to be used to ensure visual and brand consistency across various print and digital applications. The guidance in this publication pertains to all NSPRA-branded materials produced by the association as well as to those produced by NSPRA members, chapters, partners/sponsors, vendors or other outside groups. 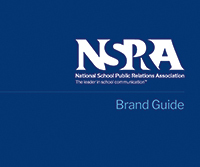 If you have difficulty viewing the brand guide online or if you would like to request the NSPRA logo files, contact the NSPRA associate director at mbraham@nspra.org or (301) 519-1227 for more information. NSPRA chapters located in a region hosting an upcoming NSPRA National Seminar should abide by the association's brand guide (PDF) when developing any chapter promotional materials that use NSPRA’s brand assets. Use the chapter’s name or abbreviation in its Seminar logo design, along with the NSPRA logo if desired, so that the logo is clearly branded as being from the chapter (NSPRA Executive Board policy 255.2). Submit the chapter's Seminar logo to the NSPRA associate director (mbraham@nspra.org) for review before the logo is used publicly (NSPRA Executive Board policy 255.2). Host chapters who would like to request the NSPRA logo files should contact the NSPRA associate director at mbraham@nspra.org or (301) 519-1227 for more information.